A drug rehab program ran an ad that got my attention. It involved a live elephant walking around the inside of a house full of people who are trying their best to ignore it. Clearly, obviously the elephant is by far the most noticeable and largest presence. A son is doing homework, head-phones on, eyes fixed. Elephant walks by. Doesn’t flinch. A mother is doing dishes in the kitchen, washing them, putting them away, and vigorously determined not to be distracted by the enormous mammal filling up her kitchen. Elephant passes by her too. No reaction. It is a stunning display of dysfunction in the face of a reality that is engaging the senses but receiving no recognition. The viewer is put into a dysfunctional family as a member of the house and reacts normally (“Hey, there’s an elephant in the room!”) while those who should be most concerned are acting like nothing is wrong. The metaphor for un-addressed, un-discussed, and unresolved alcoholism lands with force. Someone has to say something. But many times no one says anything. All of these thinly veiled appearances mask a deep and abiding reality that is so obvious no one wants to say it out loud. Outreach to men suffers because of a fundamental lack of quality on multiple levels. Like bad body odor mediocrity sends a very clear message to the men: The inattention is intentional, we are not thoughtful about you and, therefore, we do not value you. This message is then cross-referenced. Thoughtful about high school students? Yes. Children? Yes. Weekend service? Triple-dog yes. Women? Yes. Men? No. They get it. They see it. They feel it. More tragically, they will get the affirmation all men seek other places, with other people, and in other ways where they see and feel concern and quality. Oh, and let’s not forget, they will spend insane amounts of money in the process. Quality starts with seeing the value, promise, and power of something and then, based on the value, thoughtfully seeking to invest energy, time, and resources to send the clearest possible message. Here is how men filter quality and are used to experiencing quality in all other domains. Human capital spent. Who on staff is the stakeholder for the men? Or, is the most powerful asset for church health you have just one thing among many in the portfolio of a junior staff person or underwhelming layman? Well Supported, Man Specific Vision. Jesus made this job one and so should we. He said to a group of men: “Come, follow Me, and I will make you fishers of men,” (Matthew 4:19). It reflects a trifecta of best practice revelation: the priority of men to our Lord, the process and the product. Invitation leading to imitation, impartation, and ignition of a vision of God. It has a transcendent purpose for where the process is taking men. Great leaders know and communicate where they are taking those following. Quality You Can See and Feel. Men are visual, first impression driven, and do not associate with things that reflect poorly on their own reputation. On the other hand, they are big time evangelists when a product or service oozes quality for the same exact reason. GET THIS: Men enthusiastically and eagerly recommend quality they personally see, personally feel, and personally experience. Their sniffers are highly sensitive to quality and highly repulsed by mediocrity. More than 3 million men later and tens of thousands of surveys tell us that these leanings in men are indisputable facts and they are exact reasons why the foundation of the Sleeping Giant movement, strategy, pathway, media vault of content, and church plan we have developed for men does not allow for mediocre. To this end, do some powerful quality control and you might wake a Sleeping Giant walking around your own house for God’s purposes! What’s the financial investment in the men annually? What is the intentional and intelligent vision/strategy you have to get men in, healthy, strong, and going in ways they perceive as meaningful and consistent with God’s purposes? Is the presentation, communication, and content your men receive on a weekly basis for spiritual growth the best available? Why? Why Not? Is the pathway and culture for men in your church reproducing quality salvations and transformations of men that self reproduces outside the weekend service? If you were a man in the congregation or community, would you go to your own men’s offerings? Is what you are putting out there compelling, relevant, and spiritually robust? Is men’s ministry producing quality leaders to support your pastoral vision? Answering these questions honestly is the first step. The second step is recognizing and responding to the reality of your answers, eliminating mediocre and taking strong steps toward replacing it with quality you are proud to put forward to the men of your congregation and community. Remember, strong actions and investment in your men will be reciprocated with equally strong actions and investment by your men back toward the vision of the church. See and say “bye-bye” to the elephant of mediocre ministry to men and say hello to intelligent and excellent ministry to men. Quality on all levels will send a new message to your men: you matter. 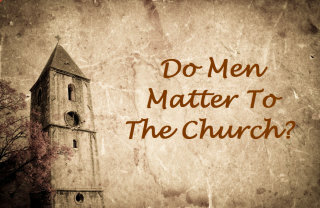 Learn how to IGNITE the men in your church NOW! Kenny Luck is the president and founder of Every Man Ministries. As the former men’s pastor at Saddleback Church in California and current leadership pastor at Crossline Community Church, Kenny has found the proven way to improve men’s ministries around the world. Sleeping Giant is this blueprint, and gives men the tools they need to lead and understand their own men’s ministry. Watch Kenny’s teachings at EveryManMinistries.com and start your men’s group today!